Home » Folio » Winners announced! 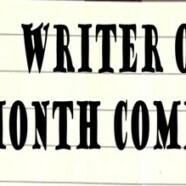 Results for the ‘Writer of the month’ competition held by the Folio team on Friday, 10 December 2010, are now out! Mr Muhammad Wajeeh Ahsan for a short story titled ”Raven’s Redemption”. Mr Ehtisham Ahmed Cheema for a motivational essay titled “Ashes to ashes, dust to dust. Life is short so party we must”. Mr Ahsan Ali for a narrative essay titled “Hard Copy; Hard Work” about getting print outs at FCC.